Heavenly blog! : No. 659: Billy Graham preaches that it is not necessary to be saved, then salvation is available to all regardless of religion, Jesus warned against false prophets! No. 659: Billy Graham preaches that it is not necessary to be saved, then salvation is available to all regardless of religion, Jesus warned against false prophets! Billy Graham preaches that it is not necessary to be saved, then salvation is available to all regardless of religion, Jesus warned against false prophets! Jesus spoke of the time with a time of many false prophets. Matt. 24 11 and many false prophets will arise and lead many astray. 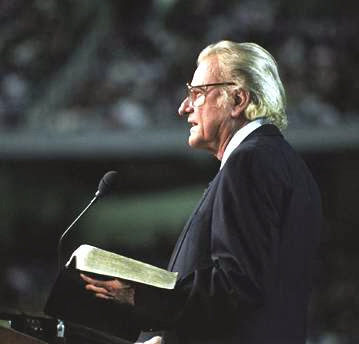 After these sessions with Billy Graham is it obvious to the most positive that Billy Graham is one of the Word preacher who believes that salvation is necessary and required if one is a "good" Muslim, Buddhist, etc.